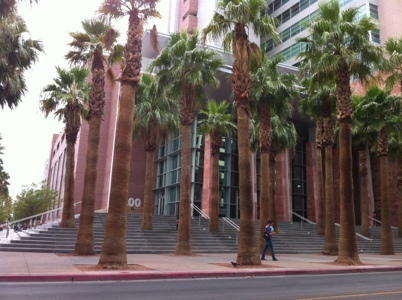 The Regional Justice Center in Las Vegas is located at 200 Lewis Ave., right on the corner of Third Street and Lewis. It is home to the Justice Court, Municipal Court and District Court. If you have a Court date it is recommended that you get there at least 30 minutes before your scheduled time. Parking is an approximately five minute walk. At the front entrance you have to walk through a metal detector and in the morning it could take 15 minutes just to walk through the detectors . Once inside you have to look for your names on the video monitors to verify your court location. If you have a warrant or ticket and you want someone to take care of it just contact eBAIL Online Bail Bonds in 3 minutes or less or call 702-462-9200 and our friendly staff will take care of you. eBAIL is a Better Business Bureau accredited bail bond company in Las Vegas servicing also the Summerlin, Green Valley, Henderson and North Las Vegas area.